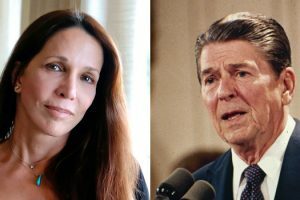 President Ronald Reagan’s daughter, Patti Davis, gave a telling interview to Yahoo News, which aired on Mar. 19, and she opened up about how her dad would feel about today’s Donald Trump-era GOP. Patti Davis, 66, the daughter of the late Ronald Reagan, who served as the 40th U.S. president from 1981 until 1989, made an appearance on the Yahoo News series, Through Her Eyes, hosted by Zainab Salbi, on Mar. 19, and she opened up about her political opinions and how she thinks her dad would be utterly disappointed with the current state of the Republican party, run by Donald Trump. In addition to speaking out about Trump and today’s politics, Patti opened up about how she often publicly disagreed with many of her father’s policies, which led to them having a rocky relationship. She also talked about how she was able to reconcile with him before he passed away of pneumonia complicated by Alzheimer’s disease in 2004.